If you like noir then you’ll love this. If you like supernatural fiction you’ll love this. If you like great descriptive prose you’ll love this. 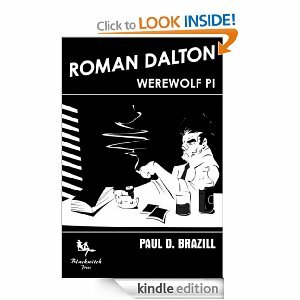 Paul D. Brazill has been writing his Roman Dalton werewolf PI stories now for about 3-4 years. I enjoy the pure escapism of it, the author’s imagination roams in the same way that Roman roams the streets of The City. What this collection of stories brings is a sense of solidity to the city for me. With each little revelation we get another insight into the place the author calls simply The City. I enjoy the fact that anything can, and often does, happen there and it seems there are no boundaries. The descriptiveness is at times heavy and other times a feather’s touch but nothing disturbs the flow of the stories and the style, which is vitally important here. Brazill’s writing is like a watermark and you can tell his work instantly. To me it’s become as comforting as meeting an old friend - you know you’re not going to end up frustrated and unfulfilled. The relationships between the characters has also been intensified and made more solid. With the release of Roman Dalton PI it feels like the series has reached another higher level. Absolutely top rate. Thanks much for this. Glad you enjoyed Roman's world.